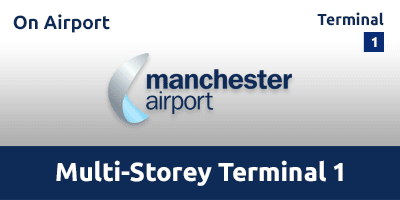 If you're looking for short stay parking serving Manchester Airport Terminal, 1 then look no further. This car park is perfect for travellers taking trips of just a few days - offering great value, secure parking that's just a short walk from the terminal. Terminal 1 is just a short walk away along covered walkways. Regular security patrols and well-lit parking areas covered by CCTV ensure there's no need to worry about your car, or your own safety. The Manchester Airport Multi-Storey Terminal 1 Car Park has a Park Mark® Safer Parking Award. Spaces for disabled drivers are available on a first-come first-served basis and cannot be pre-booked. This car park is open 24 hours a day, throughout the year. Follow the road round and the Hilton Hotel, followed by the Clayton Hotel, will be on your left. At the first roundabout take the ramp up to the left, signposted for T1 Drop-off A. Enter the car park under the sign 'Multi Storey' on the right-hand side. Drive to the entry barrier and the Automated Number Plate Recognition system (ANPR) will recognise your booking and open the barrier. Proceed into the car park and find a space. Make the short walk to the terminal. Please ensure you allow time to park your car and make your way into the airport terminal. Pick up your car from the car park. Head to the exit barrier, insert the token you were issued on entrance. The barrier will rise allowing you to exit the car park. Any problems, simply press the assistance button for 24-hour assistance.